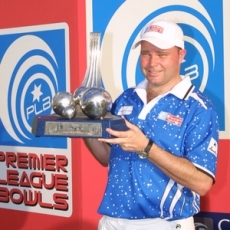 Henselite UK sponsored player Paul Foster won the Premier League Bowls title for the third time as he edged out Englishman Mark Royal in a dramatic one-end shoot-out. Royal won the first set of the final 5-4, but Scot Foster, using his Henselite Tiger Planet Earth 4HW bowls, claimed the second 9-5 and then won the decider 1-0 to lift the trophy and collect the £10,000 top prize. “I’m delighted with the way I’ve played throughout the tournament,” said Foster, who also won the event in 2008 and 2009. “The final was my worse game with some good ends but some scrappy ones but I dug deep and am very happy to win it. “Winning it for the first time is always going to be the most special but to come back and win it for the third time is amazing, especially with the quality of the players here.